Reach past the big screen and build the ultimate Transformers collection with Studio Series figures. Each figure in the Studio Series lineup is inspired by an iconic movie scene and designed with specs and details to reflect the Transformers movie universe. 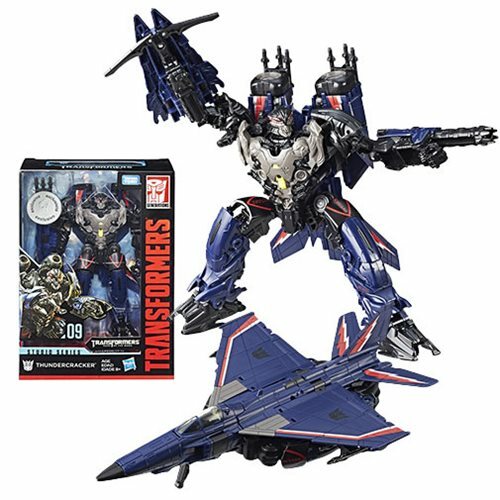 This Studio Series 09 Voyager Class Toys "R" Us Exclusive Thundercracker figure is inspired by the Chicago Aerial Offensive scene from the movie Transformers: Dark of the Moon. You may remove the head and replace it with Prime Masters or Titan Masters heads (sold separately), or have either of those small robots serve as a pilot. Includes figure and backdrop. New Toys and Collectibles: KISS Figures, Marvel Statues, TRU Exclusives, and More!